Did you hear the one about the Aussie, the Canadian and the Dominican? No? Well, you're about to. This is Carolina. She is 21, one of nine siblings, and lives in the Dominican Republic. I sponsored her with Compassion a couple of years ago, investing in her life through letters of encouragement and love. God blessed our relationship, and she was always open and honest in her letters. She would often ask my advice about things and gave me a clear picture into the challenges she faced in her community, including teen pregnancy, which is something she mentioned regularly. Thankfully, God gave her the wisdom and good sense to avoid that trap. I visited Carolina and her family in January 2013. You can read about the day here and I've also included the story in my book. It was not one of those "made in heaven" type days we hope for as sponsors. Carolina hardly said a word all day, and I had spent the previous three weeks visiting 14 kids in seven countries, and was just about done. Carolina mentioned she was not a Christian, and seemed to lack direction and purpose. At 18, she was not able to tell me what she was good at or what she liked to do. I was able to have a couple of impacting conversations with her, sharing from my own life experiences. I assured her that the decision to follow God was completely up to her and as soon as she did, God would show her what her purpose was; what she was created for. It was a privilege to be able to speak words of life and encouragement in person, rather than on a page. At the start of 2014 I travelled to the Philippines to work at an orphanage called The Ruel Foundation, and my friend from Canada Judy Myers took over sponsorship of Carolina. Judy is an incredibly passionate advocate and sponsor, and she was also able to visit Carolina in April 2014, 15 months after my visit. 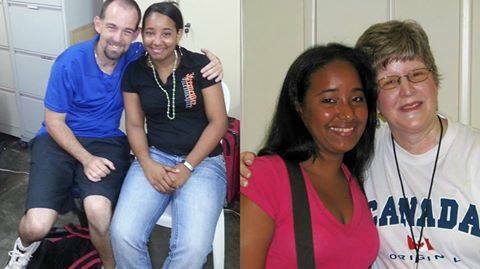 Judy said Carolina was relaxed and happy, and told her she loved God and was hoping to go to University. "Dear Judy, how are you doing? I am very glad to greet you again, although this time I'm writing to say goodbye. I want you to know that I had to leave the centre because I already completed the required age at the centre. You will be always in my heart despite the distance. I will never forget the beautiful moments we shared. I want to tell you that I learned many things during the time I was here, which helped me to be different, to think differently and to talk differently. I give thanks to God for having given me the opportunity to meet you. You are a wonderful person. I hope to see you again. I will always be very happy because I met such a special person like you are for me. I have received camps, Christmas bonuses and outings to different places during the years I was here. Thanks for the photos you sent me. They are very beautiful. My friends tell me you are very beautiful every time I show them your photo on my cellphone. You will always be with me. I want you to tell David that he will always be in my mind, and I will never forget everything we did when he came to visit me; and I'm very grateful for everything he told me; that he keeps on being here close to me despite the distance. I thank him very much for all his letters which I still keep, and I will always keep them safe in my heart; although my heart is sad because I have to say goodbye to the two of you. I encourage you both to sponsor another child so that you are of great help to that child's life, just as you both have been for me. I say goodbye with a big hug and a kiss. Even after eight years of sponsorship and advocacy with Compassion, I cannot help but marvel at the way God uses and connects us who are willing to sacrifice and be generous with what we have, to make a difference in many lives. Even across oceans and continents. Wonderful post, David! I feel so privileged that God would bless me with the opportunity to encourage so many precious children to keep dreaming and reach for the stars! Thanks for sharing this. It's just so encouraging to see God using Compassion to reach these kids and teens! !